If you are reading this and your affair has been discovered, chances are you don't know where to turn, where to go, or have any idea what will come of your life. You might feel like your life is over. Humiliation probably doesn't begin to scratch the surface of what you are feeling. You are now exposed for who you really are. You are a cheater. You are a liar. And you are a sham. There is nowhere to hide and it is time to face what you have done. You probably don't like what you see in the mirror. You can't see this now, but this is a very good place to be. For those of us that call ourselves unfaithful, we can all relate to this feeling of gut-wrenching awfulness. It is a much different pain than what our betrayed spouses feel, but in some ways not. As they look at you with the face of "how could you? ", I hope you start to ask yourself the same. This pain is going to be a necessary catalyst for growth. You will start to realize that you probably cannot or should not go back to your affair. You could, but you realize now you have to make a choice. You can't have it both ways. Your affair may have felt special but now it is out in the open for what it really was: a fantasy and a lie. You can't delude yourself any longer. The truth of the matter is evident . . . a person of integrity would have been honest and left the marriage before seeing someone else. You may start to see for the first time that leaving was never really an option or what you really wanted. It is becoming evident that you are a walking contradiction and how untrustworthy you are. The complication of the mess and pain you have created is right in front of you. You will not get out of this without pain. Escaping pain and reality was what got you into this in the first place, and now you need to face it. You have hurt a lot of people and you will be tempted to try to stuff it back in the tiny little box you thought you had kept so well under control. But like a pillow topper that is vacuum sealed, once it comes out of that shrink wrap packaging, there is no way it can ever go back in like it was before. You will feel nauseous. You will feel desperate. You will no longer feel in control of anything. You will feel very alone. Your affair partner is gone. Your spouse will feel hatred (and rightfully so) towards you as they work through their pain. Everything they ever saw about you, believed about you, and trusted you has been shattered. Deep down, they don't probably don't really hate you, but they have been destroyed and they hate what you have done. Again, the reverberating question remains. How could you? You are pretty much scum. Welcome to affair recovery. I am your fellow scum. I still refer to myself as unfaithful because that word shows the capacity of my ability to hurt people I love and care about. I call myself unfaithful because my actions have proved that I have the ability to manipulate any situation to satisfy my selfish, broken and perverted desires for affirmation. I bring up that feeling of the first few days and weeks after our own discovery, and my stomach churns thinking about it. I hope to never go back there. I never ever want to see the look and pain on my husband's face when he had to acknowledge the truth about me: the truth that I always had compartments for my pain and pleasure. If you are new on this journey and you are the lying, cheating, horrible adulterer, you will be tempted to believe the lie that you aren't worth anything and no one will ever accept you again. I am the first to encourage you that that doesn't have to be the case. It will take a long time to undo your actions. I am still working daily on being a safe person. But like the saying in AA goes…a day at a time. Every day we get to start with the acknowledgement that on our own, we ruin lives. You cannot do this alone and you won't be able to pull this off by yourself. You will need fellow strangers who you will find are not strangers, to help you heal. They will listen to your ugly stories, share their own, and offer help and healing. This is why I write to encourage you. This is why so many folks remain committed to Affair Recovery. Where are you on your journey? If you are new, have you found this feeling to be accurate? For those of you that are further along, are you committed to helping others heal? Do you believe there is a place for you? Do you believe your story is needed? Keep working hard. This life you will want will not happen out of thin air. 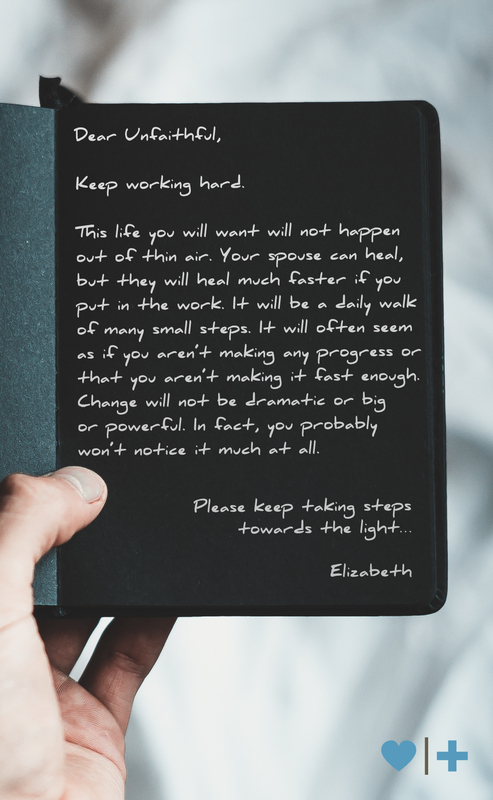 Your spouse can heal, but they will heal much faster if you put in the work. It will be a daily walk of many small steps. It will often seem as if you aren't making any progress or that you aren't making it fast enough. Change will not be dramatic or big or powerful. In fact, you probably won't notice it much at all. Change will be as small as a mustard seed at times. Please keep taking steps towards the light. . . I am new here and I just wrote a long response only to lose it. So I am 3 weeks post d-day....number 6 in this affair. My husband has forgiven me once again. I identify with every word you wrote....thank you for your honesty. I have read your other blog posts and they have really been very much my experience. I will begin my first HFH Monday. AR has already been such a help to me in beginning the needed change and healing in my soul. Thank you Elizabeth. I hope that down the road I can provide encouragement for others going through this hell. Thank you Elizabeth. I read your words and realize my unfaithful spouse has said many of the same things. You give us insight into the many ways the unfaithful also feel pain. For many months, I assumed my spouse felt no pain only disgust at being caught. With time I am beginning to realize that his pain is different but quite real. With counseling I am realizing I need to make a safer environment for him to talk and with prayer I am slowing realizing that the other woman is just a broken lonely soul with issues. I plan to borrow your letter if ok and share it with my spouse. Thanks for writing and reaching out. I am really glad to hear you are starting HFH. You will discover A LOT about yourself in that class. I will never pat myself on the back for any of my own horrific choices, but I will let you know that if you keep working hard and making change a priority, you can become a woman worthy again of dignity and respect. I am one week past the day I admitted to my wife I was having an affair. Everything you described is how I am feeling. I do want the pain to go away but I know it won't. Every morning I wake up I hope that it was all just a bad dream. But now that bad dream is the reality I live in. The world seems like it's caving in on me, but I know it's worse for my wife. I feel the shame, guilt, regret of it all. I hold out hope that it will get better. That hope is all I've got right now. I am really glad you have decided to come clean. It was probably a really difficult thing to do and for her to hear, but that is where healing can begin. Please learn from so many unfaithful spouses on this site of how to navigate this nightmare you both find yourselves in. Keep working, reading, and doing everything you can. It can get better if you put in the work. Thank you for posting and reading. I would highly recommend you both go to an EMS weekend if you can find the resources and time.